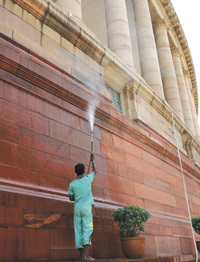 Taking strong exception to child labour on court premises, a magistrate here has ordered an inquiry into the case of a minor boy allegedly employed by a caterer at the Rohini courts complex here. The Comptroller and Auditor General (CAG) of India’s report in connection with the national Capital has pointed out the Delhi Government failed to collect Rs 13.74 crore as luxury tax from hotels as it exempted the amount received by these establishments for lending out conference halls and banquets from the purview of the tax. A Special Court of electricity has sent SPD contractor Hori Lal (Pardhan), who distributed electricity under the name ‘Majdoor Vikas Samiti’ to the residents of Shanti Camp, Mandi Pahari Village (Division Saket), to judicial custody for 14 days on charges of stealing power and depositing the power bill amount to the BSES. However, the accused was released on bail. 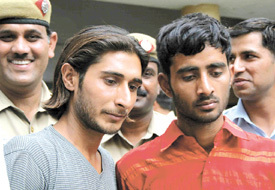 The police today claimed to have worked out the triple murder case of Lajpat Nagar, with the arrested two persons – Arjun Chaudhary (22) and Bobby Chaudhary (23). Even as the economy continues to grow at a fast clip, several other statistics indicate there are many challenges that will need to be taken into consideration if this growth is to be sustained. The police today claimed to have busted a betting racket, with the arrest of six members of a gang which was organising betting during the Sri Lanka-New Zealand semifinal match of the World Cup. The Haryana State Vigilance Bureau today nabbed ASI Arvind Kumar posted in DLF Police Station while accepting Rs 10,000 money as bribe. After living with five to 15-hour-power cuts last year, industrialists, traders, students, farmers and villagers here are putting up with three to five -hour -power cuts. The preparation of photo I-cards for voters in the district seems quite a tough task. Despite adequate publicity and a concerted drive to prepare such cards for voters here, the turnout has been poor so far. The Delhi urban development, PWD, finance and planning minister Dr A. K. Walia today gave details of a plan of action approved by the Delhi government for construction of 18 Road Under Bridges (RUBs) on railway crossings and three grade separators before commencement of Commonwealth Games 2010. The union minister of state for defence and local Congress MP Rao Inderjit today asserted that there was no threat to the Congress-led UPA government at the Centre in the face of recent series of defeat that his party had suffered at the polls. A two-day workshop on the 11th Five Year Plan is currently underway in the city. The IDFC today organised a critique of the Eleventh Five Year Plan at the NIPFP, New Delhi. The main objective behind the workshop was to highlight the difficulties being faced with the implementation of the plan and the need to bring out issues which are being neglected. Sir Ganga Ram Hospital and the World Academy of Spiritual Sciences (WASS) are organising a discourse by Sadhguru Jaggi Vasdev here tomorrow. A comparatively cool morning greeted Delhiites today with the mercury settling below 24 degree Celsius. But the Met Office said the daytime temperatures were expected to hover around the 40 degree Celsius mark. The Punjabi Academy of the Government of the National Capital Territory of Delhi is organising a three-day Kirtan Darbar, “Gurbani Gaveh Bhai,” at Talkatora Stadium here from April 27 to 30. Delhi industries minister Mangat Ram Singhal today inaugurated a gem testing laboratory in the National Institute of Jewellery Design and Technology (NIJDT) at Okhla Industrial Estate. The laboratory is the most advanced of its kind in North India. Power supply will be affected in the following areas tomorrow between 11 am and 3 pm to carry out upgradation and maintenance work at the Alaknanda Grid: S Block, G K-II, part of W Block, G K-II, NRI Block, Mandakini Enclave, Deshbandhu Apartments, Kaveri Apartments and Shivalik Apartments. The offence came to light on Monday when Metropolitan Magistrate S. S. Rathi, while going to his chamber, saw a minor boy serving lunch to various judges’ chambers. Finding the boy apparently minor, the magistrate then asked him to wait there and called for his employer by sending a messenger. Sumit, his employer, denied the boy was minor and later appeared with his counsel in the court. Taking cognizance of the matter, the magistrate has directed the police to get an ossification test (determination of age by examining bone formation) conducted on the boy to ascertain his age. The police have been asked to submit their report by May 19. Noticeably, child labour, in all its forms, has been banned by the government through a recently passed law. An audit appraisal had revealed the charges for banquet or conference halls received by the hotels were not included as receipt of the hotels for the purpose of levy of luxury tax. This resulted in short collection of tax of Rs 13.74 crore in 21 out of 41 hotels that had banquet and conference halls, the CAG observed. Justifying its act, the department concerned of the government replied luxury tax was levied on rooms provided in a hotel for residential purposes and not on its banquet and conference halls. The government also cited a Delhi High Court order which, according to it, had upheld a determination of the Commissioner (Luxury Tax) that the tax would not be chargeable where a room had been let out for any activity other than residential usage. However, the government reply did not find favour with the CAG which observed this was not tenable as the Act provided for levy of luxury tax proportionately per room based on the total period of occupation of the accommodation. Regarding the court judgement, the CAG argued, it related to levy of luxury tax on service charges and not on levy of luxury tax on account of rent or hire of banquet or conference halls. According to the Delhi Luxury Tax Act, luxury tax will be levied on the turnover of receipts of a hotel at the notified rate not exceeding 15 per cent. While accepting the bail plea, the court directed the accused to deposit Rs 6 lakh (Rs 2 lakh immediately and Rs 4 lakh by May 31, 2007) as interim amount with the BSES as payment towards the penalty bill. The SPD contractor was caught by a BRPL Enforcement Team on January 19 on charges of stealing and illegally distributing electricity. However, the main accused Jitender is still absconding. The accused were arrested from the Old Delhi Railway Station when they were waiting to board a train to Gujarat after coming from Punjab where Jitender was reportedly hiding. During inspection at the site of crime, the police noticed that there was no sign of forced entry into the house where businessman Chote Lal (55), his wife Shanti Devi (50) and his adopted son Rohan (13) had been killed. This showed that some known persons had killed the family members, the police added. During investigations, the police came to know about extra-marital affair Chote Lal was having with a woman from Saharanpur. The lady had reportedly come into contact with Chote Lal when he used to work in a private company in Faridabad. The woman was working as a receptionist there. Later, Chote Lal even started a shop at the first floor of his house for the lady. However, the husband of the lady Jitender was against their relationship. Following a tip-off, the accused persons, who were relatives of Jitender, were apprehended from the Old Delhi Railway Station. During interrogation, the duo allegedly confessed to having conspired with their uncle Jitender, who wanted to eliminate the family of Chote Lal in a revenge for the betrayal of his wife. Even as the economy continues to grow at a fast clip, several other statistics indicate there are many challenges that will need to be taken into consideration if this growth is to be sustained. Of them, arguably, one of the biggest challenges is the fact that India has the world’s largest number of uneducated children. In an attempt to make a difference, Procter and Gamble, in partnership with Child Rights and You, launched Shiksha 2007 for a third year running with the support of Tabu, Soha Ali Khan, Dia Mirza and the face of Shiksha 07, Renuka Shahane. This national launch was particularly special as it witnessed internationally acclaimed artist Jatin Das creating a live artwork reflecting the essence of Shiksha. Children associated with CRY partnered projects added coloured strokes to the painting, giving expression to their hopes, dreams and childhood unbound by the shackles of circumstance. Project Shiksha is a national consumer programme run by Procter and Gamble (P and G) in partnership with Child Rights and You (CRY). This programme allows consumers to participate in a national effort to support the education of underprivileged children in India via simple brand choices. Every time a consumer buys a large pack of Tide, Ariel, Pantene, Head and Shoulders, Rejoice, Vicks VapoRub, Whisper, Gillette Mach 3 Turbo, Gillette Series, Oral B, Duracell or Pampers during April, May and June, she will have made a definitive contribution towards enabling a child’s right to education. Irrespective of sales, P and G has committed a minimum of Rs 1 crore to Shiksha, which will be allocated to projects focused on enabling the child’s right to education. According to the district police chief Hanif Qureshi, one of the two kingpins of the gang has been nabbed, while one Bobby Gujral is at large. Gujral is the owner of Walk in Cloud hotel situated at Rajourie Garden in the national Capital. However, the police have nabbed two persons from Gujral’s hotel in this connection. When the raid was conducted on a flat in Sun City colony by a police team, the gang members were in the thick of business. They were organising on-line betting. The transaction of money used to take place in Delhi, probably at the hotel of Gujral, the lynchpin of the operation, the police chief said. The gang members were allegedly operating in Gurgaon for the past about two years, shifting addresses periodically. The police recovered seven mobile phones and a tape recorder among other things at the residence in Sun City colony. The mobile phones are alleged to have been procured on the basis of false Identity proof. Those nabbed have been booked under Gambling Act as well as Sections 420, 467, 471 and 120B of the Indian Penal Code (IPC). The official is alleged to have picked up Lancer and Ambassador cars from the basement of a residence of a lady doctor in DLF Phase-II and was demanding a sum of Rs 10,000 from her to let off the car. Following the harassment, she brought the matter to the notice of the Bureau. The official is alleged to have asked the woman to meet him at coffee shop in Bristol Hotel along with the money. The bureau officials allegedly caught the ASI red-handed while accepting the bribe. If April has been so cruel, they are fearing powerless life in May, June and July. Noida does not have a generator of its own. The work on setting up 132, 220 and 400 KV sub -stations hasn’t moved out of papers. If one cable is snapped, the sub -station has to be shut. K. G Puri, GM,Paschim Anchal Power Corporation, says power consumption in Noida is increasing at an annual rate of 20 per cent. The work of linking Noida with Pali power house is on the last lap. Noida will also be linked with Sector 66 sub-station which will mean that the snapping of Murad Nagar cable will not plunge Noida into darkness. A new transformer of 40 MVA will be installed in the 132-KV sub-station in Sector-66 in a couple of days. The preparation of photo I-cards for voters in the district seems quite a tough task. Despite adequate publicity and a concerted drive to prepare such cards for voters here, the turnout has been poor so far. The photo preparation programme had been launched on April 20 and is likely to continue till May-end to cover all assembly constituencies in Faridabad. The authorities have announced the names of those voters who fail to get themselves photographed in the given period will be struck off the voters’ list. About 32 per cent of the 9.94 lakh voters in the five assembly constituencies do not have a voter I-card at present. Sources in the district election office here said 14 teams would take up the work of photographing the voters at various spots in the assembly segments. The first phase, which will cover two assembly areas of Faridabad and Mewla Maharajpur here, will continue up to May 7. It aims to cover about 1.90 lakh voters who do not have a photo I-card till date. About 80 to 88 per cent of the 5.36 lakh voters in two segments had already been photographed. Out of these, 65 per cent had a voter’s card. The office has hired several photographers who have been asked to shoot pictures of the rest of the voters in areas already identified and publicised by the department through various means. The officials concerned have been surprised by the low turnout so far. They have declared those voters who do not get photographed this time may lose their vote. A notice has been issued under Section 22 of the Representation of People Act, 1950. Only 1827 voters had got photographed so far in the past five days in the two constituencies, claimed an official here today. He said the photography was free and the teams would leave for another segment after the scheduled date. Ballabgarh and Palwal are next. May 9 and May 22, respectively, are the dates for these two areas. The authorities had struck off about 16,664 voters in the last such drive due to voters not turning up for a photograph for their cards. The total number of voters in Mewla Mahrajpur and Faridabad segments is 3, 02,892 and 2, 33,182 respectively at present. The main reason for many voters not turning up for this work may be the fact that several of them may have their names in the voters’ list at more than one place. Faridabad has a large migratory population and a large number of the residents could have more than one vote due to various reasons. The authorities, however, claim the deletion of the names of voters who fail to get themselves photographed may solve the problem to some extent. The Act provides a sentence of one year in jail and a fine or both if one is found guilty in this regard. These projects, for which the government gave green signal today, would be executed by the Municipal Corporation of Delhi (MCD). The government during the current financial year has earmarked Rs 300 crore for the MCD for execution of projects relating to transport sector, including Commonwealth Games. The decision was taken at a high-level meeting presided over by Walia. The meeting was attended by senior officers of UD Department and Engineer-in-Chief MCD. Walia said that construction of RUBs and Road Over Bridges (ROBs) on railway level crossings had become imminent to curb accidents and ensure smooth flow of traffic in congested areas where railway level crossing exits. The Delhi government had instructed the MCD to award work relating to these projects within next six months and complete construction well within the stipulated time limit to avoid any cost escalation to enable the government to make available new infrastructure to the people at the earliest, he added. Eighteen RUBs on railway level crossing would cost Rs 402 crore whereas three grade separators at Subhash Marg, Delhi Gate, Pankha Road Dabri Crossing and Rani Jhansi Road from Filmistan to Boulevard Road would cost Rs 256 crore. These three places have become centre of optimum traffic congestion causing delay and harassment to the commuters and vehicle owners. The minister expressed confidence that scenario of road traffic would considerably change with the execution of these 21 projects. He made it clear that 50 per cent cost of the RUBs on railway crossings would be borne by the railways, whereas the rest would be taken care by the local agencies, including Delhi Government. He added that spade work for most of the above 21 projects had been completed whereas for a few projects, it would be expedited to enable the MCD to start construction work by the end of this year. The RUBs would come up on railway level crossings near Vivek Vihar Railway Station connecting G.T. Road to ITI Vivek Vihar, Sarai Kale Khan, Samaypur Badli on Auchandi Road connecting GT Road to Badli Industrial Area, Sultanpuri, Sewa Nagar-Prem Nagar, Najafgarh-Vijwasan Road near Vijwasan, Lajpat Nagar Jal Vihar with Jangpura near Erose Cinema, Nahari Road crossing at Narela-Lampur Road, Roshnara Garden near Shakti Nagar, Sawan Park near over bridge at Ashok Vihar, Badli Village Level Crossing, Rohtak Road Rampura, Rohtak Road near Jakhira, Ring Road leading to Shakurbasti Railway side, Mangolpuri to Rohtak Road, Kirari Railway Crossing, Kirti Nagar-Prem Nagar and Mundka Railway Crossing. Addressing a press conference, he claimed that the UPA government would complete its full term at the Centre. When asked if he was airing the general apprehension among his party leaders, he answered in the negative. Rather, he said that his party would now emerge as a single largest party with absolute majority on its own if there was a snap poll. Rao Inderjit Singh said that there were speculations in various quarters about mid-term election to the Lok Sabha in the face of reverses that his party faced in some of the states where assembly elections were held. In response to a question on the causative factors that have led to his party’s set back in the elections, he said that after the seventies, party stalwarts who had a genuine feel of the pulse of the people started retiring. The vacuum was filled by ‘paratroopers’ who have now come of age and were guiding the party’s affairs. They lacked that uncanny ability to gauze the people’s mood resulting in the organisation facing set backs, he added. With regard to the ongoing elections in Uttar Pradesh, he said that his party would improve its overall vote bank percentage. With regard to Haryana, he claimed that the state was making all round progress. In connection with Gurgaon, he lamented that the plan to either set up Corporation or Gurgaon Development Authority for speedy and integrated development of Gurgaon was not being realised. However, he was evasive in his reply to a question if the bureaucracy was jacking the proposal. He also said that it would not be in the interest of Haryana if other cities were developed at the cost of Gurgaon. Gurgaon was attracting the attention of the Centre and investors from all directions, he added. With reference to the SEZ, he said that his apprehension that fertile agriculture land of Gurgaon would be gobbled up by SEZ project had now been allayed in the face of Group of Ministers at the Centre making amendments in the parameters to set up SEZ projects. Experts from various fields are participating in the workshop to create a platform for an interaction on the 11th plan. Deliberations have been held on growth targets suggested in the approach paper that should be achieved and, if not, what requires to be done to achieve the desired outcome by the end of the XIth Plan. Deliberations are also underway on agricultural and industrial sectors as well as on services, energy, infrastructure, health, education, urban and regional development, rural development, employment and poverty alleviation, environmental sustainability issues and financing of the plan. Many academics like Prof O.P. Mathur (NIPFP), Prof. Utpal Sharma (CEPT, Ahmedabad), Dr Suneel Pandey (TERI), Prof. P. Mukhopadhyay (Centre for Policy Research), Dr Shashank Bhide (NCAER), Prof Vijay Paul Sharma, Prof V. N. Asopa, Prof Sebastian Morris, Prof G. Raghuram (IIM, Headband), Prof Prem Kalra, Prof Rajiv Shekhar, Prof R. C. Sharma, Prof R. K. Theresa etc among others took part in the deliberations. The approach paper submitted for the workshop met with wide criticism because it included only JNNURM as part of the urban development due to lack of comprehension of what cities can do in the next five years in terms of economic growth and poverty reduction. Academics expressed the view that the commission does not appreciate that the sharp distinction, which used to exist earlier between urban and rural areas, is steadily disappearing. By neglecting the cities, 9 per cent of economic growth and 11-12 per cent of industrial growth cannot be achieved. Experts feel that for rural development the paper has reproduced a wish list. The spiritual leader will speak on the theme ‘Circus of the mind’. Chief Minister Sheila Dikshit will be the chief guest at the discourse at FICCI Auditorium, while Member of Parliament and Indian Council of Cultural Relations Chairman Dr Karan Singh will be the special guest. Dr S.K. Sama, Founder Chairman, WASS and an eminent gastroenterologist, says that human beings create their own destiny by making correct choices. He recommends spiritual practices of regular exercise, Yoga, meditation and diet besides nurturing mind with the positive emotion of love, compassion, humility, coincidence, non-judgement and acceptance. The minimum temperature was recorded at 23.5 degree Celsius this morning, down three notches from yesterday’s 26.9 degree Celsius. The NIJDT has been promoted by the Delhi State Industrial and Infrastructure Development Corporation to provide trained human resource for the jewellery industry and trade in Delhi, Singhal said. He appreciated the efforts of the NIJDT in helping jewellery industry and trade in the national capital. The government would strive hard to make it a world class training centre. NIJDT chairman and managing director Manoj Parida said that the laboratory had been set up at a cost of Rs 22 lakh .It has state of the art gem testing equipment and the best possible technologies from domestic and international markets. The laboratory will charge a nominal fee for its services.